There is a front and a back to all quadcopters! The front of the Cheerson CX-10 quadcopter is the direction with the blue LEDs. The back of the quadcopter has red LEDs and the On/Off switch. The right-hand control stick moves the quadcopter forward, backward, left and right. These directions will always be from the perspective of the quadcopter, no matter which way it is facing or has rotated. Use the provided USB charging cable to charge your quadcopter from a computer. Do not attempt to use an iPhone/iPad, etc wall charger as that may damage the battery. Never leave your charging quadcopter unattended or plugged in for longer than necessary. All lithium ion batteries can be dangerous if over charge, which may lead to a risk of fire. The charging is complete when the LED light in the charging cable goes out. Power on the quadcopter on a flat and level surface. Power on the transmitter (always ensure the left-hand stick is all the way at the bottom first). Now that both the quad and transmitter are powered on, move the left-hand control stick all the way up and then all the way down. You should hear a series of beeps while doing so. When complete, all four lights on the quad should be light solidly and not blinking. If still blinking, please retry. Your quadcopter is now armed and ready to fly! There is a front and a back to all quadcopters! The front of the Cheerson CX-10 quadcopter is the direction with the blue LEDs. The back of the quadcopter has red LEDs and the On/Off switch. 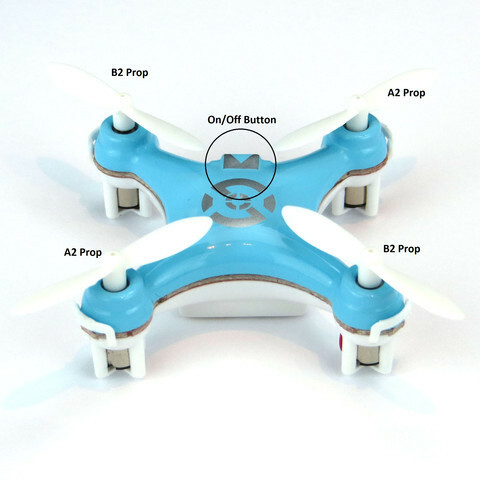 The right-hand control stick moves the quadcopter forward, backward, left and right. The left-hand control stick on the transmitter controls the throttle (up/down) as well as the yaw, which controls the rotation (spin left or right) of the quadcopter. These movements of the quad will always be from the perspective of the quad, no matter which way it is facing or has rotated. These means that pushing forward on the control stick will always make the quad move in the direction that the blue LEDs are facing. When learning to fly, try not to turn spin (yaw) the quad so that the front is always facing the same direction. As the quad moves around, turn your body so that you are always facing the same direction that the quad is facing. This helps to keep track of which direction is forward, backward, etc. 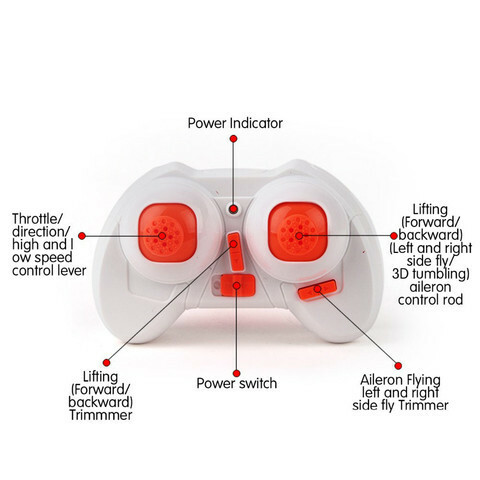 The throttle is very sensitive, try using a very soft touch while learning how to fly. If you lose control, you can always power down the quad by lowering the throttle all the way down, this will shut off the motors immediately. Under normal circumstances, it is usually better to cut the throttle and crash than to have the quadcopter fly away! To execute a flip, simply push the right-hand stick in (like you are pushing a button). You should hear a beep, which means you are ready to do a flip. Next, simply push the same stick in either of the four directions to make the quadcopter flip in that direction. Always make sure that you are not too close to an object before conducting a flip. The quadcopter may gain or lose altitude or move sharply left or right while flipping. All quadcopters have two motors that spin clockwise and two that spin counterclockwise. Each of these motors also use a different propeller. If a propeller meant for counterclockwise direction is placed on a clockwise spinning motor, there will be no lift generated. Each propeller is marked on its underside with either an A1, A2, B1 or B2 marking. The numbers are not important, however the letters are. These letters correspond to the direction in which the propeller is designed to spin. When changing a propeller, always be sure to replace it with anther propeller with the same letter (again, do not worry about the numbers).- You can also use the picture below as a guide for which motors take which propellers. Please note where the on/off switch is in the picture to ensure that you are changing the correct ones. If the quadcopter is drifting to the left, push the directional arrow pointing to the right. This will tell the quadcopter to adjust itself more to the right in order to compensate for the drifting to the left.- It is recommended that you only use one click at a time in to not overcompensate in any one direction. Solution: This typically means that one or more of the props are not installed correctly (they do seem to come from the factory this way sometimes). Please see the above instructions for proper propeller placement. 1 – This typically means that the quadcopter is not calibrated. Please see the recalibration information above. 2 – You may need to use the trim controls to counteract the drift. Please see the section above regarding trim controls. Solution: This typically means that one or more of the propellers is on incorrectly. Please see the Changing the Propellers section above.